Starting in Pacific City, this byway takes you to Cape Kiwanda State Park which offers stunning views of the coastline including Haystack Rock. 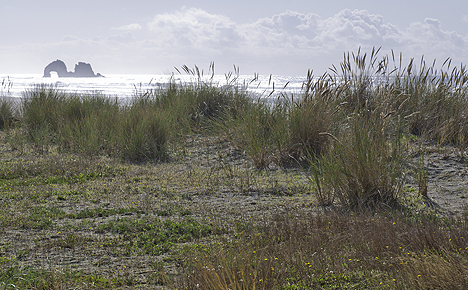 Continuing on the winding road leads to Cape Lookout State Park where hiking trails and scenic viewpoints are located. The last part of the loop passes through Netarts Bay onto Cape Meares State Park where you can tour Cape Meares Lighthouse and hike to the famous Octopus Tree. Cape Meares State Scenic Viewpoint. Phone: 503-842-3182; Toll-free: 1-800-551-6949. GPS: 45.469878 N; -123.968901 W.
Part of the Three Capes Scenic Route, Cape Meares State Scenic Viewpoint features an 1890's Cape Meares lighthouse that you can tour, hiking and walking trails through old growth spruce trees including the "Octopus Tree". Viewing migrating whales is possible in the winter and spring. Munson Creek Falls. Phone: 503-842-3182; Toll-free: 1-800-551-6949. GPS: 45.365364 N; -123.804079 W.
Walk the short trail leading to the stunning Munson Creek Falls. Standing at 319 feet, this is the tallest waterfall in the Coast Range. Breathe the scent of ancient western red cedar and Sitka Spruce trees. Late fall through winter you can watch the waters for spawning salmon. Cape Lookout State Park. 4293 Highway 101, Tillamook, OR 97141. Phone: 503-842-4981; Toll-free: 1-800-551-6949. GPS: 45.36682 N; -123.962148 W.
Part of the Three Capes Scenic Loop, Cape Lookout is located between Netarts Bay and the Pacific Ocean on a sand spit. This is a pet-friendly park offering amazing ocean views with easy beach access. Over 8 miles of trails wind through a lush old-growth forest. For shorter hikes, take the nature trail that provides close-up views of native tree and plants with number markers. Oceanside Beach State Recreation Site. Phone: 503-842-3182; Toll-free: 1-800-551-6949. GPS: 45.461173 N; -123.970468 W.